Compression therapy is commonly used with moderate to severe lymphoedema. In the active phase of treatment and periodically in the maintenance phase multilayer bandaging is implemented. It is especially used when a large volume reduction is required or to soften fibrotic oedema. It also has increasing use prior to new garments as there is an opportunity for greater reduction. 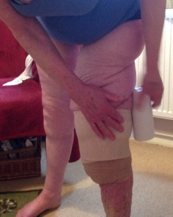 Most times it’s carried out by the lymphoedema practitioner but for many reasons self- bandaging may be implemented. There are a variety of bandage systems including traditional multilayer bandaging, two layer systems and compression wraps or a combination of these. Patients attended a self-bandaging clinic with multilayer bandaging. The program included an intensive course of self-bandaging for a period of between 3 -12 weeks. These clients re-bandaged themselves each day and were assessed weekly by their lymphoedema practitioner who monitored volume, pain and range of movement. Reductions of 48 – 92% and reported global rate of change > 80% for 75% of participants was achieved. It assisted selected patients with independence and self-efficacy. 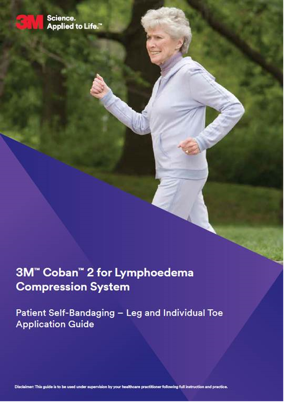 At the 2014 International Lymphoedema Framework conference in Glasgow a poster by Debbie O’Halloran explored the topic of Empowering the Lymphoedema Patient to Apply Compression Bandaging. Mrs K a 73 year old with primary lymphoedema in the left leg including a lobule at her knee was unable to wear compression stockings due to lack of strength to apply them. A solution was to wear a compression sock and toe caps and then Coban 2 bandage above to the groin. She did this twice weekly and over a period of 18 months excess measurements went from 144% to 66%. Once this stabilised she only needed to self-bandage 1-2 times per week. The result has also meant that she is more mobile and in control of her lymphoedema. I have previously taught clients and their support people to bandage with multilayer bandaging. With this, often complex technique, there has always been a risk that they would bandage incorrectly and safety issues. The previous poster presentation inspired me to explore the use of Coban 2 for self-bandaging and undertake a pilot study. This may be because of limited resources in lymphoedema services. Access may be difficult due to distance especially if the client lives in a rural setting. Also life commitments such as work, family and relying on carers can prevent the client regularly attending a lymphoedema service. Self- bandaging enables a client to be actively involved in their own care and have another tool in their toolbox. 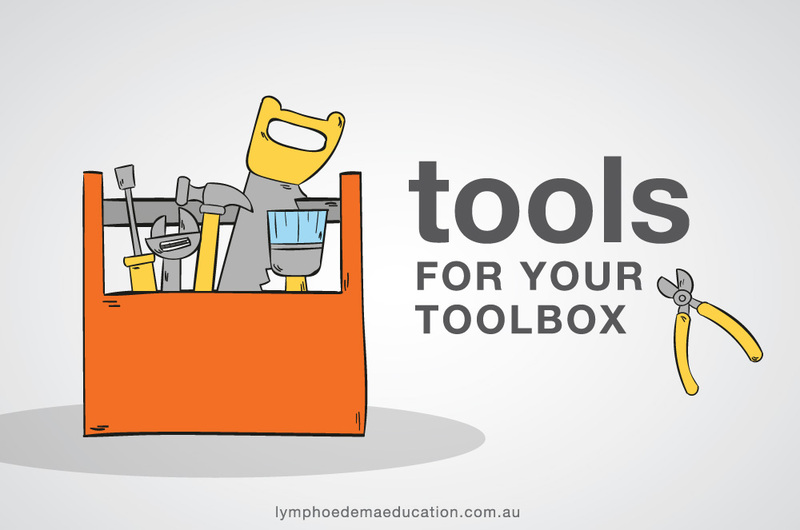 Lymphoedema can get worse or flare up for a variety of reasons such as heat, activities that aggravate. Most times this is not when they are due to see their lymphoedema practitioner. Self- bandaging gives them an opportunity to address the issue immediately and take control of their ongoing maintenance. Previous bandaging by practitioner. It may be easier, for some clients, if they have initial bandaging with the practitioner so they can be monitored and maintenance or top ups are performed by the client. Provide them with educational resources to aid them with their application. Two clients with non-complex upper limb lymphoedema and lower limb lymphoedema were chosen. Both previously had practitioner applied multilayer bandaging and Coban 2 bandaging. There were no medical, mobility or cognitive issues. Both wanted another option for their toolbox of management techniques. Jill a 39 year old who is self-employed and has a background in marketing. When she commenced this trial she had a 4 year old and has primary lymphoedema in her left leg since she was 18 years old. The left leg circumferences compared to her right leg ranged from 4 to 10cm greater. Christine 61 years of age was diagnosed in 2009 with left metastatic breast cancer. In 2010 she underwent a left wide local excision and axillary lymph node dissection. This was followed by chemo therapy, radiotherapy and hormonal treatment. Due to recurrences she has ongoing chemo therapy. Demonstration of Coban 2 bandaging by the practitioner. Three self- bandaging practices with the third videotaped for their use. 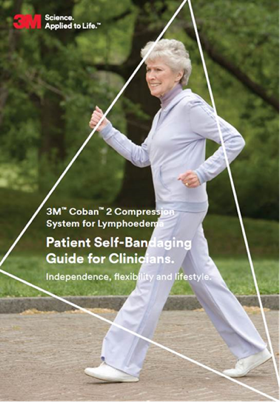 The clients were supplied with the 3M patient information flier and practitioner bandaging charts for them to use and provide feedback. Initially bandaging 1- 2 times per week for 4-6 weeks. Both clients then continued to bandage as required. 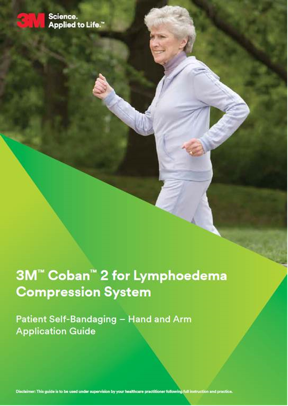 The clients reported that self-bandaging with Coban™ 2 was found to be more effective than traditional multilayer bandaging. It was easier to apply, reduced the risk of tourniquet and slippage. In fact Christine came up with an innovative way to roll the bandage on. View this technique in the video below. Most importantly they found they were empowered to treat themselves within the privacy of their home and the confidence to manage their lymphoedema between practitioner visits. The flexibility of this bandage allowed them to perform activities that they previously could not undertake. “You can bandage yourself at home anytime without relying on your physiotherapist. Be prepared have tape, elbow and finger pieces ready. If unable to bandage finger/ toes consider a glove. Play the self-bandaging video and watch each stage before attempting. Essential use 3M Cavillon No Sting. Modify and look outside the square. Following this pilot study and with the input of both Jill and Christine the following resources have been developed.